Jerusalem's Lot is a small town east of Cumberland and twenty miles north of Portland. It is not the first town in American history to just dry up and blow away, and will probably not be the last, but it is one of the strangest. Ghost towns are common in the American Southwest, where communities grew up almost overnight around rich gold and silver lodes and then disappeared almost as rapidly when the veins of ore played out, leaving empty stores and hotels and saloons to rot emptily in desert silence. In New England the only counterpart to the mysterious emptying of Jerusalem's Lot, or 'salem's Lot as the natives often refer to it, seems to be a small town in Vermont called Momson. During the summer of 1923, Momson apparently just dried up and blew away, and all 312 residents went with it. The houses and few small business buildings in the town's center still stand, but since that summer fifty-two years ago, they have been uninhabited. In some cases the furnishings had been removed, but in most the houses were still furnished, as if in the middle of daily life some great wind had blown all the people away. In one house the table had been set for the evening meal, complete with a centerpiece of long-wilted flowers. In another the covers had been turned down neatly in an upstairs bedroom as if for sleep. In the local mercantile store, a rotted bolt of cotton cloth was found on the counter and a price of $1.22 rung up on the cash register. Investigators found almost $50.00 in the cash drawer, untouched. People in the area like to entertain tourists with the story and to hint that the town is haunted; that, they say, is why it has remained empty ever since. A more likely reason is that Momson is located in a forgotten corner of the state, far from any main road. There is nothing there that could not be duplicated in a hundred other towns except, of course, the Mary Celeste-like mystery of its sudden emptiness. Much the same could be said for Jerusalem's Lot. In the census of 1970, 'salem's Lot claimed 1,319 inhabitants a gain of exactly 67 souls in the ten years since the previous census. It is a sprawling, comfortable township, familiarly called the Lot by its previous inhabitants, where little of any note ever took place. The only thing the oldsters who regularly gathered in the park and around the stove in Crossen's Agricultural Market had to talk about was the Fire of '51, when a carelessly tossed match started one of the largest forest fires in the state's history. If a man wanted to spin out his retirement in a small country town where everyone minded his own business and the big event of any given week was apt to be the Ladies' Auxiliary Bake-off, then the Lot would have been a good choice. Demographically, the census of 1970 showed a pattern familiar both to rural sociologists and to the long-time resident of any small Maine town: a lot of old folks, quite a few poor folks, and a lot of young folks who leave the area with their diplomas under their arms, never to return again. But a little over a year ago, something began to happen in Jerusalem's Lot that was not usual. People began to drop out of sight. The larger proportion of these, naturally, haven't disappeared in the real sense of the word at all. The Lot's former constable, Parkins Gillespie, is living with his sister in Kittery. Charles James, owner of a gas station across from the drugstore, is now running a repair shop in neighboring Cumberland. Pauline Dickens has moved to Los Angeles, and Rhoda Curless is working with the St Matthew's Mission in Portland. The list of 'undisappearances' could go on and on. What is mystifying about these found people is their unanimous unwillingness or inability to talk about Jerusalem's Lot and what, if anything, might have happened there. Parkins Gillespie simply looked at this reporter, lit a cigarette, and said, 'I just decided to leave.' Charles James claims he was forced to leave because his business dried up with the town. Pauline Dickens, who worked as a waitress in the Excellent Cafe for years, never answered this reporter's letter of inquiry. And Miss Curless refuses to speak of 'salem's Lot at all. Some of the missing can be accounted for by educated guesswork and a little research. Lawrence Crockett, a local real estate agent who has disappeared with his wife and daughter, has left a number of questionable business ventures and land deals behind him, including one piece of Portland land speculation where the Portland Mall and Shopping Center is now under construction. The Royce McDougalls, also among the missing, had lost their infant son earlier in the year and there was little to hold them in town. They might be anywhere. Others fit into the same category. According to State Police Chief Peter McFee, 'We've got tracers out on a great many people from Jerusalem's Lot--but that isn't the only Maine town where people have dropped out of sight. Royce McDougall, for instance, left owing money to one bank and two finance companies . . . in my judgment, he was just a fly-by-nighter who decided to get out from under. Someday this year or next, he'll use one of those credit cards he's got in his wallet and the repossession men will land on him with both feet. In America missing persons are as natural as cherry pie. We're living in an automobile-oriented society. People pick up stakes and move on every two or three years. Sometimes they forget to leave a forwarding address. Especially the deadbeats.' Yet for all the hardheaded practicality of Captain McFee's words, there are unanswered questions in Jerusalem's Lot. Henry Petrie, and his wife and son are gone, and Mr Petrie, a Prudential Insurance Company executive, could hardly be called a deadbeat. The local mortician, the local librarian, and the local beautician are also in the dead-letter file. The list is of a disquieting length. In the surrounding towns the whispering campaign that is the beginning of legend has already begun. 'Salem's Lot is reputed to be haunted. Sometimes colored lights are reported hovering over the Central Maine Power lines that bisect the township, and if you suggest that the inhabitants of the Lot have been carried off by UFOS, no one will laugh. There has been some talk of a 'dark coven' of young people who were practicing the black mass in town and, perhaps, brought the wrath of God Himself on the namesake of the Holy Land's holiest city. Others, of a less supernatural bent, remember the young men who 'disappeared' in the Houston, Texas, area some three years ago only to be discovered in grisly mass graves. An actual visit to 'salem's Lot makes such talk seem less wild. There is not one business left open. The last one to go under was Spencer's Sundries and Pharmacy, which closed its doors in January. Crossen's Agricultural Store, the hardware store, Barlow and Straker's Furniture Shop, the Excellent Caf?, and even the Municipal Building are all boarded up. The new grammar school is empty, and so is the tri-town consolidated high school, built in the Lot in 1967. The school furnishings and the books have been moved to make-do facilities in Cumberland pending a referendum vote in the other towns of the school district, but it seems that no children from 'salem's Lot will be in attendance when a new school year begins. There are no children; only abandoned shops and stores, deserted houses, overgrown lawns, deserted streets, and back roads. Something strange is going on in Jerusalem's Lot ... but no one dares to talk about it. By day, 'Salem's Lot is a typical modest New England town; but when the sun goes down, evil roams the earth. The devilishly sweet insistent laughter of a child can be heard echoing through the fields, and the presence of silent looming spirits can be felt lurking right outside your window. 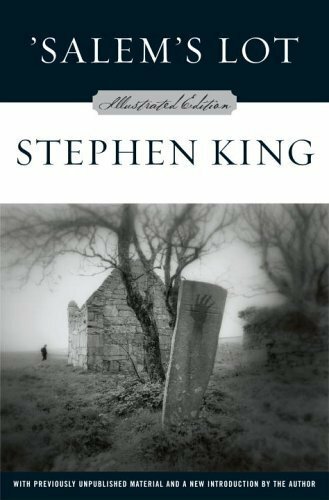 Stephen King brings his gruesome imagination to life in this tale of spine-tingling horror.